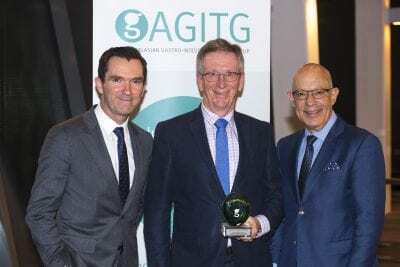 Pictured – L to R: Professor Tim Price AGITG Chair; Professor John Simes recipient of the 2018 John Zalcberg OAM Award for Excellence in AGITG Research and Professor John Zalcberg OAM. Professor John Zalcberg OAM, was a founder of, and is immediate past Chair, of the Board of the AGITG. He served in the Chair role for over 18 years until May 2014. He was the Director, Division of Cancer Medicine, at the Peter MacCallum Cancer Centre in Melbourne, Australia for 17 years prior to recently taking up the position of Professor of Cancer Research at Monash University. He was a founder of the Lorne Cancer Conference and a past Board Member of Cancer Trials Australia. He is the current Co-Chair of the Cancer Drugs Alliance and Interim Chair of the Australian Clinical Trials Alliance. A past Board Member of the NSW Cancer Institute, past President of the Clinical Oncological Society of Australia, and a past Member of the Consultative Council of the Victorian Cancer Agency, he has received a Medal of the Order of Australia Award (OAM), the 2011 Cancer Achievement Award from the Medical Oncology Group of Australia and is the recipient of the 2014 Tom Reeve Award awarded by the Clinical Oncology Society of Australia. Professor Zalcberg’s clinical research interests include gastro-intestinal cancer and health care outcomes. He has published more than 230 articles in peer-reviewed journals. He was a Principal Investigator for the EORTC advanced GIST trial in Australia and continues an active involvement in trials in this disease as well as other GI cancers. He continues an active clinical practice in GI cancer. be nominated by two AGITG members. biographical outline of the nominee. letters of support from two individuals outside the nominee’s institution (where applicable). These letters should contain a critical appraisal of the nominee’s contributions to the AGITG research program. The recipient will have an opportunity to deliver an address (up to 20 minutes) at the AGITG Annual Scientific Meeting in 2020 highlighting appropriate aspects of their area of interest, with the option to also be published in abstract form on the AGITG website and in the AGITG Annual Report. Applications close at 5:00PM AEST on Thursday 4th July. Recipients will be informed in writing of their successful nomination by 25th July. Presentation will be made at the AGITG Annual Scientific Meeting. Completed nomination forms should be forwarded by email to agitg@gicancer.org.au by 5:00PM AEST on Thursday 4th July marked John Zalcberg OAM Award Nomination. For more information about the John Zalcberg OAM Award for Excellence in AGITG Research contact the Chief Executive Officer, Russell Conley.